Steve Liskow is the author of three mystery series, and his latest book is Hit Somebody. In 2016 he became the Black Orchid Novella Award‘s first repeat winner. You can read his winning story “Look What They’ve Done to My Song, Ma” in the current July/August 2017 issue. Here, he talks about the evolution of this story, his previous winner, and the Woody Guthrie series. “We live most of our lives in Plan B.” Was that a bumper sticker, a button, or a tee shirt? I don’t remember, but I agree with the claim. In fall 2003, I wrote the first draft of a PI novel that went through dozens of revisions and several title changes. I sent it out with the PI named Rob Daniels, Eric Morley, and at least one other name I no longer remember. In 2013, I finally self-published it as Blood On the Tracks. In late 2004, after attending the Wesleyan Writers Conference, I wrote “Stranglehold,” a short story installment in what I saw as a series set in Detroit. Unfortunately, it was almost 7000 words, too long for most magazines, and the others rejected it. I showed it to a fellow writer who said he had trouble keeping track of so many characters in the first three pages. I needed all those people, so I shelved the story and turned to other projects. In fall 2006, a friend suggested I write a romance novel. Ghost Writers in the Sky became a romantic mystery spoof set in Connecticut with deliberately over-the-top characters, including a PI named Zach Barnes. Between 2007 and 2009, I sent it to nearly seventy agents and publishers with underwhelming success. Late in 2008, I learned that the Wolfe Pack, named in honor of Rex Stout’s Nero Wolfe, sought entries for the Black Orchid Novella Award. Stout’s work influenced both my prose and my tone, so I wondered if I could expand “Stranglehold” to 15,000 words and introduce the large cast more slowly. Plan B, indeed. Over the next week, I added 9000 words and realized that nothing felt like padding. The story was a novella waiting to be recognized. By then, the Barnes novel was dead in the water, but I liked the character’s name. I gave it to my Detroit rock ‘n’ roll wannabe and sent the new and improved (I hoped) “Stranglehold” to the contest early in 2009. 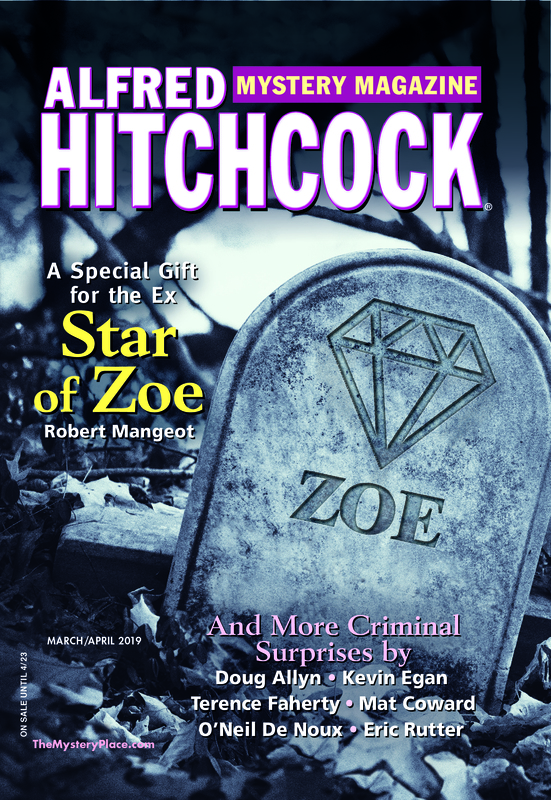 A few months later, I learned of a new local publisher looking for Connecticut mysteries and sent the Zach Barnes novel out to them, too…with the same protagonist. My wife convinced me to change the title, to Who Wrote the Book of Death? This has to be about Plan C, right? Six months later, Jane Cleland called to tell me “Stranglehold” had won—twenty-four hours after Mainly Murder Press offered me a contract for Who Wrote . . . ?. Now Zach Barnes had two cases, one in Detroit and the other in Connecticut, a tough commute. Beware of changing the name of a character because it will change the rhythm of every sentence in your story that names him or her. Ah, the joys of computer technology. I did a global edit and changed “Barnes” to “Nines.” Same rhythm, same consonant sounds. “Zach/Zachary” became “Greg/Gregory” and there we were. A few reviewers wanted to read more about “Greg” and his beautiful girlfriend. Some readers went to my website and told me they thought Greg Nines was a dumb name. By then I’d also noticed that Spell-check went spastic every time I used “Nines” as the singular subject of a sentence. Hmmm. Eighteen months later, I parted company with that publisher and re-edited the book. The Detroit series was still generating huge waves of ennui, so I changed the PI’s name back to Zach Barnes . . . in Connecticut. Zach now appears in five books. In 2013, when I self-pubbed Blood On the Tracks, the first in the Detroit series, the PI formerly known as Zach needed a new name. My high school classmate, session musician Susie (Kaine) Woodman, inspired the character of Megan Traine, so I still wanted him to be musical. After bouncing ideas off my wife (much better at names and titles than I am), my equally brilliant webmistress (ditto), and my cover designer, we came up with Elwood Christopher Guthrie, who goes by Chris. Naturally, everyone else calls him “Woody.” Woody’s fourth adventure, Before You Accuse Me, will arrive in December or January. “Look What They’ve Done to My Song, Ma” is a sequel to “Stranglehold.” I actually planned the story as a novel, but didn’t find any of the possible subplots intriguing enough to bear writing, so it ended up as another novella—this time shrinking to size. If you read both stories in Alfred Hitchcock, you noticed the name change. Now you know why. Plan G, Plan H, Plan I . . .
Congratulations to Mark Thielman, whose novella “A Meter of Murder” won the 9th Annual Black Orchid Novella Award! The author was celebrated at the December 5th Black Orchid Banquet as part of The Wolfe Pack’s weekend of festivities. Mr. Thielman, who currently hails from Texas, is a former prosecutor. You can look forward to reading the novella—his first published piece of fiction!—in the July/August 2016 issue of AHMM.